Synopsis: A famous fashion photographer develops a disturbing ability to see through the eyes of a killer. Review: Deep down inside, somewhere where most of my guilty pleasure movies are filed away, I know that Eyes of Laura Mars isn’t good. It’s a hollow thriller that misses the mark on many levels and doesn’t achieve what it sets out to do. Moreover, it has one of the dumbest endings of all times…so bad that I wonder if it wouldn’t have been better if projectionists had just turned off the movie and sent everyone home five minutes before the film concludes. At least you’d leave with a bit of a zing and without your eyes tired from rolling in exasperation. 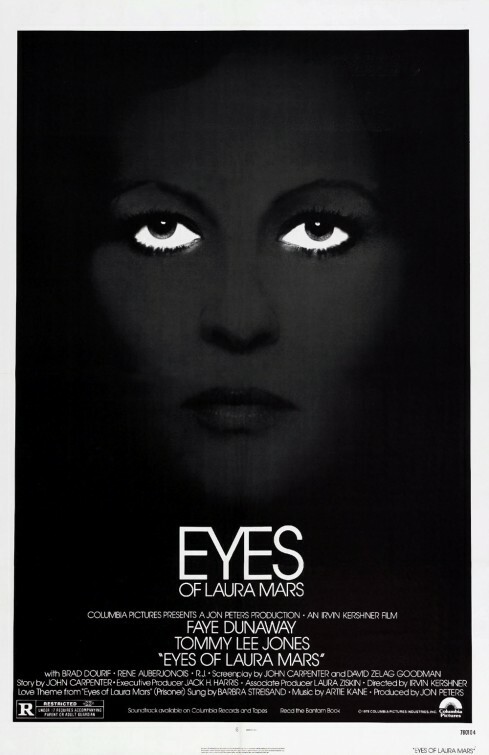 Yes, Eyes of Laura Mars is a kitschy late ‘70s thriller attempting to have some class. Yet here it is, featured early on in 31 Days to Scare. Why? It’s just so…entertaining. Whether you’re actively engaged in it or far removed, it’s never dull and not the museum piece it could have become. And it has Faye Dunaway (fresh off her Oscar win for Network) turning up her crazy knob long before her famously camp performance in Mommie Dearest. Laura Mars is a famous fashion photographer known for glamorizing violence to sell product. Her images have galvanized the population and have attracted the ire of one demented psycho. Conveniently, when the killings begin Laura discovers a psychic link between herself and the murder, allowing her to see what the killer sees. When her closest friends and colleagues start getting their eyes plucked out and with a brutal manic gaining on her, she teams up with a cop (Tommy Lee Jones, Hope Springs) to unmask the fiend. Originally intended as a vehicle for Barbra Streisand (her then-boyfriend produced the film and Streisand contributes an impressive song for the opening and closing credits), Dunaway is actually quite good here even when she’s ferociously overacting. Known for her frustrating method ways, if Dunaway knew the film was shaky she doesn’t show it but instead sinks her fangs in even further. Jones is surprisingly upbeat and even blasts out a few smiles. Brad Dourif (Color of Night), Rene Auberjonois, & Raul Julia (credited as R.J.!) are the various men in Laura’s life who wear their red herring T-shirts with gusto. Rumor has it George Lucas was so impressed with a rough cut of this film he hired director Irvin Kershner to direct The Empire Strikes Back. Kershner and cinematographer Victor Kemper (National Lampoon’s Vacation) do give the film an elegant, classy sheen but there are enough close-ups of Dunaway’s eyes bugged out and wild to be featured in some sort of mascara ad. Though many of the costumes by Theoni V. Aldredge are stuck in the ‘70s, Dunaway is beautifully decked out in tartan plaids and regal attire but pity the models stuck in dreadful fad clothing, forever on celluloid wearing fancy togas. Even though there are some interesting sequences, like Dunaway being chased through an abandoned building while seeing through the killer’s eyes as they gain on her, there’s a restraint that starts to sink the film. Low on blood and feeling watered down from a more violent version, someone (the studio, the director, etc) decided to play it safe instead of going for the jugular. The script (from a 10-page treatment by genre legend John Carpenter, Halloween) feels like a dozen people wrote it. There’s zero interest in finding why Laura and the killer have a connection and no real detective work in trying to figure out whodunnit until the third act when half the cast has been sliced and diced. Watching it again recently (as I do every few years), I was surprised I only just realized the movie is an attempt to Americanize the Italian Giallo film. With its heightened sense of reality, its focus on celebrity and excess, and its embracing of glam-violence Eyes of Laura Mars is a noble but ultimately hopeless attempt to capitalize on the popular films successfully imported from Italy. Had someone like horror maestro Dario Argento or Lucio Fulci taken a crack at this, it may have wound up being a film with more lasting impact and imagery. And they would have fixed the ending.